Well, I'm 80% done with the sunflower shawl. My Sky Mist marker is getting weak, so I have ordered more and will finish the front of the shawl when they arrive. The back and lace for the edges are finished and just waiting on the front to be completed. So...today I'm going to work on the pumpkins...since I didn't get to them a week or so ago. Last week Nickola (granddaughter #1) and I hung my hummingbird feeder and last night she came running into the house to tell me that while she and PawPaw were grilling a hummingbird zoomed by to go to the feeder. She was so excited! I was too. We did a high five and I told her how great it is that the hummingbird found the feeder she helped put out! Her smile and excitement were precious. 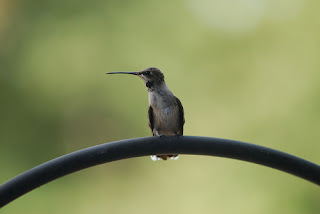 Last year we had two hummingbirds fighting over the feeder, and it was right at our familyroom window, so we were able watch them all the time. When we would sit on the patio they would zoom by us and didn't really care how close we were. I took this picture last year when the hummingbird was just sitting looking into our familyroom while we watched TV. It was amazing. I was able to even go outside and take pictures without him (or her) caring a bit that I was only a few feet away.